Well, it’s official. I am now flat-out offended by Canadians who look down their noses on the CFL…and think the NFL is the be all and end all (the only Shakespeare quote you will ever read from me…essentially because I don’t know any others). 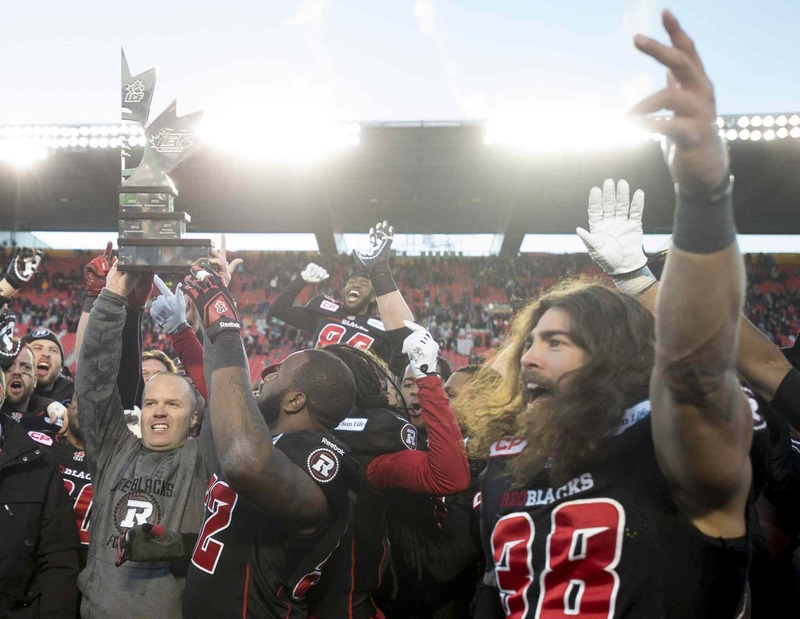 Ottawa Redblacks weren't even around two years ago...now they're in the Grey Cup. Just another thing that makes the CFL great. I was talking to some guys at work last Saturday about the next day’s football games and, after a moment or two, realized they were jacked about some mid-season, ho-hum NFL contests, while I was talking about the CFL’s Grey Cup Division Finals. Forever, I’ve heard all the loud, overly passionate, bombastic arguments. The NFL is bigger. The players are bigger. They hit harder. The receivers and quarterbacks are more skilled. All true. But it does not make better football. It’s charming to watch our national youth be brainwashed. One of Canada’s challenges is learning to be proud of our accomplishments (sporting or otherwise), rather than apologizing for them. Canadians are not great at celebrating and preserving our history and not being afraid to crow about it. But Americans excel at it. And it’s that type of promotion that bamboozles young NFL-loving tykes into thinking the American game is so much better than ours. Oh, an NFL telecast has shinier graphics. More virtual lines. Many more cameras. More replay sources. Longer lenses. But that’s just lipstick on the pig. Nothing to do with the on-field product. Football purists watch football to see a good game. That’s it. Nothing more complicated. And I like to think I’m a purist. I don’t watch to see players whose career accomplishments have been miles overblown by a bunch of self-important, greasily groomed broadcasters. That’s all the NFL is. I can count on two hands the number of NFL games I’ve ever seen that I would put into the “remarkable” category. And I could count the Super Bowls in that category on one hand. Those games occur in the CFL all the time. There have been Grey Cup blowouts, for sure. 1990 comes to mind…Blue Bombers 50 v. Eskimos 11. And 1977 wasn’t great. Especially if you were living in Edmonton. Alouettes (and their staples) 41 v. Eskimos 6. Dave Cutler held up his end. 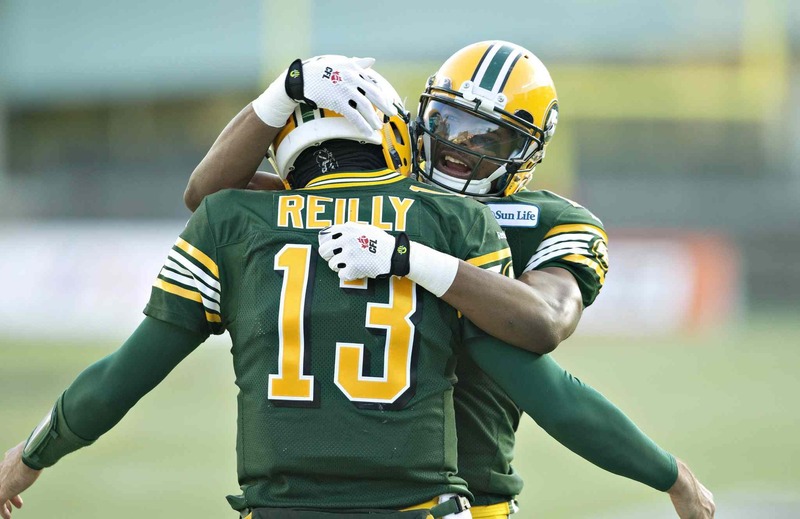 Two years ago, Mike Reilly's Edmonton Eskimos were 4-14. Now they're in the Grey Cup. But the best football game I have ever seen was a Grey Cup game. Of course, I’m remembering 1989. Dave Ridgway’s last-minute field goal made the final Roughriders 43 v. Tiger-Cats 40. The CFL even let an American team win the Grey Cup (1995, Baltimore Stallions). But that’ll never happen again…thank gawd. Think about it. How many Super Bowls do you remember as great games, from opening kick to final whistle? The CFL’s Division Finals were just one never-ending example of much better games in this country. But make no mistake. The CFL is far from perfect. The Toronto Argos are an embarrassment. Not the club on the field. I’m talking about the off-field marketing, promotion and their utter lack of understanding of the Argos’ fan. I love that, next year at BMO Field, the Argos will introduce tail-gaiting and other fan-friendly activities outside the stadium. That alone will make me consider going to a game much harder than I have in recent years. And I love that fans in Hamilton and Ottawa (maybe the two most rabid, passionate CFL cities – not provinces, Saskatchewan – cities) got to see great teams this year. 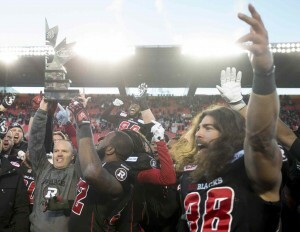 This image is pure Canadian football. Full of pride. Full of red and white. Just the way it should be. It’s great that the CFL gives players chances. Doug Flutie threw one pass at Boston College that everyone remembers. Then was a back-to-back Grey Cup MVP in 1996 and ’97 for the Argonauts. Rocket Ismail played pro football because of the CFL. Ditto Mike Clemons. And Tracy Ham. And hundreds of other guys who just weren’t quite big enough or bad enough (or unlawful enough) to play in the NFL. And yet, shockingly, they were damned good football players. Now, I’ll give you this. If you like way too much defence and watching one or two plays run every five minutes-or-so of real time, the NFL is definitely for you. Today, the Detroit Lions played the first of a Thanksgiving tripleheader. It was a blow-out. And so boring. And, as I write this, Cam Newton’s Panthers are clobbering Tony Romo’s Cowboys. What it boils down to is the number of big plays. Every CFL game has a bunch of them. If you’re lucky, in an NFL slugfest, you get a couple. How is that better football? That’s right. It isn’t. Well mate, I have watched CFL games. I guess it would have to go back to when ESPN first televised CFL games that I became aware of them. So, I’ve watched a number of games. The NFL as well as college football has been mostly what I have grown up with. In one sense, I am an expert on football. Now to your premise that CFL is better. I have watched the NFL since the early 70’s and the CFL since, maybe, the 80’s and also at different quantities. The CFL rules are different in many respects and visually different if we compare the field and the downs. This plays a part in the quality, but there are additional aspects to review. The NFL by far has the better talent. For me, this is like a comparison of NHL to AHL (both of which I have seen). The talent level lead the CFL to be at times blah. Game play. You are right about defensive qualities. Well, I do enjoy a good defense. What fun is there when “everyone” scores? This is as bad as soccer or “fútbol” for the NA elitists, when there is no scoring. The NFL makes obvious attempts to balance the two (with a lean towards offense). What makes the NFL better than the CFL is the complexity of the defense and how they battle the offensive designs for supremacy. Sorry, but I don’t see that in the CFL. It may be exciting to see the receiver run before the ball is snapped, but it appears gimmicky to me. The 3 vs 4 downs drives the differences between the two leagues. Three downs limits the variability in the CFL whereas the NFL allows for more complexity and forces defenses to counter the offense more so. Crap, I’m writing a book, so I’ll end prematurely. The CFL is a decidedly step down in quality and content from the NFL. It is difficult to compare 32 teams to 9 teams and determine the excitement level. This was the fundamental problem with the NHL for a long time except the NHL was full of talent. The CFL does not have the luxury of talent. So, you will see blowouts in the NFL simply due to the fact there are more teams. The CFL is less likely to have this issue with 9 teams. The talent difference between 1 and 32 is quite large. How big of a difference is it with 1 and 9? I’m not disparaging the CFL but only placing them in context. I can’t watch a CFL game completely even when the Grey Cup is televised. Somehow, I am more drawn to watch an NFL Super Bowl in its entirety. Example: Last night was Montreal vs Ottawa. I couldn’t make it into the halftime. It was meh. I was watching Division II NCAA football. It was dull. I encourage all Canadians to support the CFL! I keep trying to watch it and occasionally do find a game that I’ll watch for three quarters or more. Support the CFL! That is ridiculous of you to think there are no big plays, when there are recievers and running backs rushing and receiving for for multiple 150+ yard games now a days. Not to mention that with the NFL boasting a healthy 32 teams and 8 conferences. Compared to the CFL’s meager 9 teams. With so many conferences and teams there are a plethela of storied rivalries, competition, hatred, and real raw football played. Plus a handful of our NCAA teams could beat your CFL teams even with your watered down rules. The NCAA also has more storied rivalries, bowl games, and traditions then you could pack into those 9 CFL teams of yours ten fold. Canadien football simply does not compare to American football, and this is coming from someone who lives in Michigan and has seen quite a load of CFL games. Hey Nolan Mitchell, Canadians invented football. the CFL predates the NFL by over 50 years. 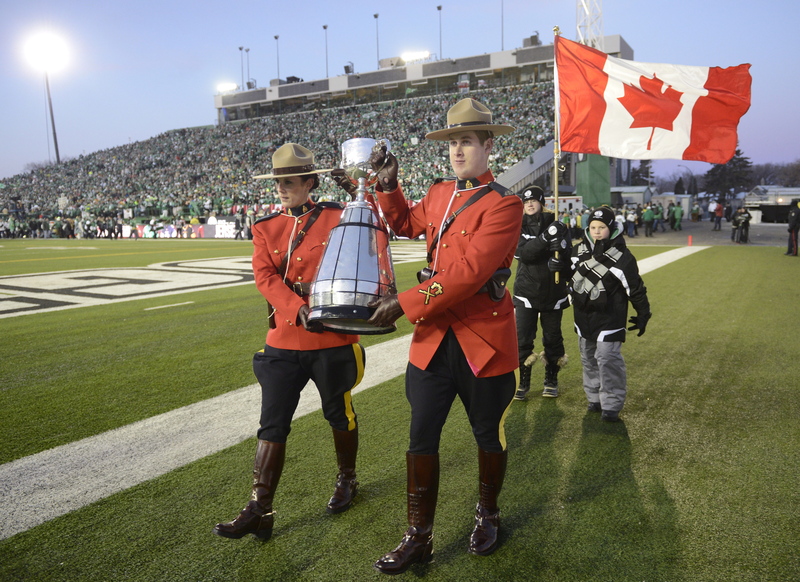 The first CFL championship was the Dominion Championship in 1884 first NFL trophy wasn’t until the next century. An average NFL rusher will run 3-4 yards a carry, that would be useless in the CFL. A CFL rusher has to run 6-8 yards per carry to be any good at all. An NFL team would lose to a CFL team at CFL rules in a heartbeat. An NFL team would have to drop 30 pounds just to be able to play CFL and the TWENTY SECOND PLAY CLOCK. An NFL lineman would have a heart attack trying to play a 20 second CFL clock its less than NCAA. AJ Moritz you make me laugh. There is way more passing yardage thrown and longer rushing plays in the CFL, way better plays. NFL teams would get their butts handed to them at CFL rules. There is never even close to as much history in NCAA and NFL combines than the CFL. The two oldest pro sports franchises in North America are the Toronto Argonauts (CFL), and the Hamilton Tiger-Cats (CFL). And Canada invented gridiron football. American football was more like soccer until you guys adopted our gridiron rules. Has an NFL QB ever thrown 700 yards in one game? the NFL record is 554 back in 1951. On a regular basis CFL QB’s have cracked that in a game and our record is 714 in 1994. Many times I’ve watched QB’s just last season get very close to 500 or more in the CFL.